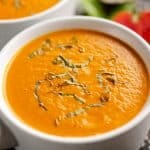 Pressure Cooker Creamy Garden Tomato Soup is a delicious recipe made in your Instant Pot with ripe tomatoes from the garden along with Parmesan, balsamic vinegar and pesto for amazing flavor! Add your tomatoes to a large bowl and pour boiling water over them. After a few minutes, using dishwashing gloves to protect your hands from the heat, peel and core the tomatoes. Turn your electric pressure cooker to saute and add the butter. When the butter is melted add the onion and cook for 2-3 minutes or until translucent. Add the garlic and cook another minute. Turn off the saute function. Add the remaining ingredients except the Half & Half & Parmesan. Set the pressure cooker for 5 minutes on high pressure and turn the valve to seal. When the time is up, release the pressure using the valve and carefully remove the bay leaf. Add the Parmesan and Half & Half to the pot and transfer the soup in batches to your blender. Blend the soup until it is smooth. Serve topped with fresh basil or homemade croutons.